Well the show starts tomorrow night so I should be getting paintings packaged up, labeled and ready to hang but instead....I can't stop painting! 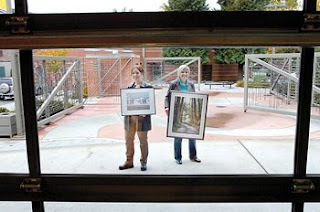 This is a photo of Wendy Milne and myself taken by Paul vanPeenen of us holding our paintings that will be in the show. John did a wonderful write up for us in the Coquitlam Now, check it out.